Purchase Mondo Homo (if you can still find a copy). In the print world, Richard's words have appeared in The Advocate, Los Angeles Confidential, and CARGO Magazine, to name a few. 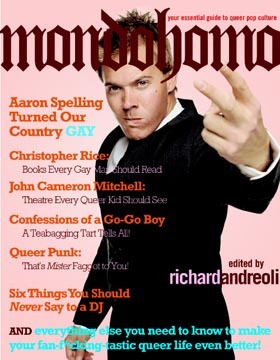 In 2004, Richard published his first book, Mondo Homo: Your Essential Guide to Queer Pop Culture. This landed him as a pop culture expert on the TVLand special Inside TV Land: Tickled Pink, as well as on numerous TV shows, radio programs, and magazine interviews. Fun Fact: It now costs more to ship the book than it does to purchase it on Amazon.com. With this editorial experience, Richard launched a 48-page quarterly publication for Comic-Con International: San Diego, the largest pop culture convention in the United States. This led to a position at Here Media, where he helped the company's print editorial teams expand their web presence. He also relaunched the editorial arm of Gay.com and Gay.net, creating a new revenue stream for the company. From there, Richard moved to the digital marketing agency Content.ad, spearheading their advertorial business. He and his team also conceived, developed, and launched First To Know, Knoworthy, and TopKit, as well as relaunched the health website SuperFoodsRx.